The creators have already said that it doesn't have machinery in it and that's why it is so affordable but it still needs a power source doesn't it? How is the Omni powered and will it work internationally? This machine wont work in Australia unless it is 220-240 volts. Have the creators said that they have thought of this or is it going to be a problem if you don't live in america? If anyone knows anything please give me an answer. I am not completely sure there is no active tracking device in the base itself: it was one of the explored idea. "our IMU PODs use custom sensor fusion algorithms with magnetic anomaly correction that eliminate orientation drift." Depending on the sensor hardware that tracks the POD's the 5V from the USB cable could be enough to power the Omni. I would not be suprosed it that is the case. Otherwise i would think it would be a 12V or so wall wart. But thats just complete speculation. "Inertial Measurement Units (IMUs) is a self-contained system that measures linear and angular motion usually with a triad of gyroscopes and triad of accelerometers. An IMU can either be gimballed or strapdown, outputting the integrating quantities of angular velocity and acceleration in the sensor/body frame." In this case, no electronic in the Omni base, only in the PODs, powered with their own intern batteries ? 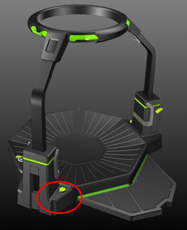 Could this be confirmed by virtuix staff ? The POD's need to send the location data somewhere. I would asume there whould be some electonics in the base collection the positional data the POD's are braudcasting, then calculate the direction and speed and then send those to values to the virtuix drivers on the PC via USB cable. Thats how i would do it The hardware would be low power, low cost and low latency. And yes the POD's would need to have some kind of Batter or super cap. I would asume the USB ports on the pods are only for charging. Actually Jan did mention how they can now emulate the left and write came pad. I wouldnt be suprised if the Omni shows up as a USB HID device and does not even need any special drivers for basic functionality. You would then only really use the Virtuix drivers when games take advantige of the advanced capabilities of the Omni. But even then you could still probubly get away with it beeing a HID device...... Then the Omni API could just be some helper class's to make things easer for the developers and posably integrate with things like Unity. As to the original question "How is it powered?" - @Jorgen is correct, the pods will be charged via a microUSB connector. The Omni will have it's own plug in power supply (wall adapter) capable of handling 110 / 220, much the same as most adapters these days. The plug itself will simply need to be swapped out with the appropriate provided connection for your location. ah okay so we charge the PODs via USB cable, great news. but why would we need to plug the Omni into the wall socket, I thought that had no moving parts or needed no power? Thanks for the precisions, @Dev_Guy_Robert‌ ! @OculusRiftRocks‌, as mentioned by @xxann5‌, the Omni base probably gather the raw info from the two PODs and compute the corresponding joystick-like commands to send to your computer. So, it needs it own power supply. yeah why is there not a control box which receives signals from the PODS, seems odd to have to plug the huge omni device itself in with power. so would you need to connect the omni to the PC via USB for it to work? and how often would you charge the pods, how long do they last, is mains powered charging offered for faster charging? why can't the omni be USB powered anyway, does it really need to power of the mains, if it is just sending controller inputs to the PC surely it must only need the same power requirements as a gamepad? I know it was announced that bluetooth was also available for wireless connection. hmmm, shouldn't really need that, you get USB powered wheels and razer hydras. so the PODs send the data to the omni then, maybe its the receiver in the omni that needs the power, but sending and analogue joystick to the PC wont wake much power I think. There is a control box. In our case it is attached to the Omni. You are basically plugging into the control box, which also enables you to charge the pods from the Omni base. oh right, so you plug the mains power into the control box, and you can charge the pods from the omni base you say, that's good news, hopefully it will be stronger than USB charging. Yes - or if you are like me and have several microUSB devices, you may charge the pods using these adaptors as well. so does the control box sit outside of the omni then? "In our case it is attached to the Omni." well then it's not really attached to the omni then 'The Omni will have it's own plug in power supply' , it should be more 'the control box will have its own power supply, which is attached to the omni'. but what I am confused about is, you say you charge the pods via the omni base station, not the control box, is the control box giving power to the omni base station just for pod charging? I think your confusion comes from the fact that, as the control box is included in the Omni base, in @Dev_Guy_Robert‌ explanations, Omni base = control box. oh right, so by 'In our case it is attached to the Omni' you mean it is actually inside and part of the omni? Yep - the power provides a means for charging the pods, and also to power the electronics that collect information from the pods and transmits meaningful data to the computer via USB or mobile device via Bluetooth. This is all housed in a box molded into the Omni base, right where the big power button is located.